Our mission is to welcome all people at Church of the Servant into an open, caring and accepting community that promotes spiritual growth in Christ. Whether you’re a visitor or longtime member, you’ll find multiple ways to link up with like-minded people at Church of the Servant. Households are small groups of 10-15 people that meet at least monthly for friendship, sharing, and prayer. We encourage every member to join a COS Household group. Our congregation is divided into 8 geographic areas. 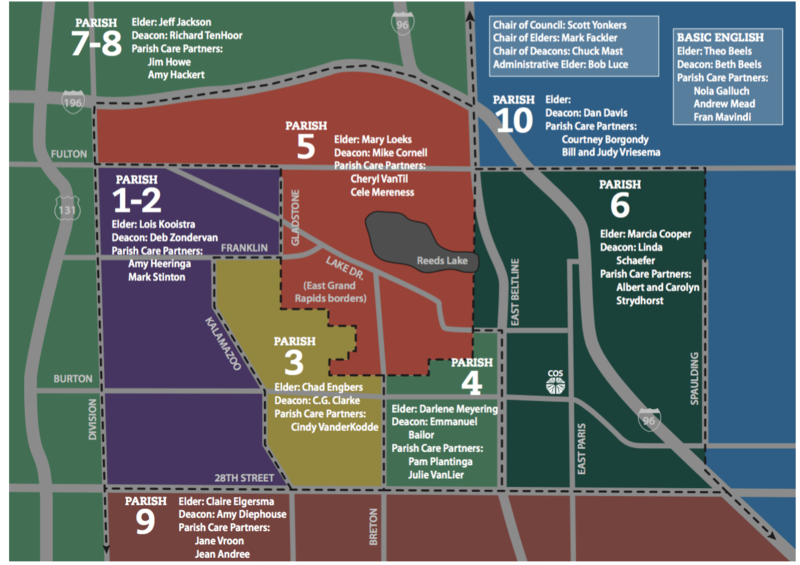 Each area has a Parish Care Team of one elder, one deacon, and at least one parish care partner. The Parish Care Teams want to meet each person in their parish, will pray for each person, and provide spiritual and practical support for each member. We want to meet our visitors! We have a Welcome Kiosk inside the east entryway. Someone is always there on Sundays looking to meet the new folks. Twice a year, new member classes are held. We become a healthier church when we commit to each other and to Christ through joining the church. Come visit our library. We have books for everyone. Wednesday nights, Thursday mornings and Saturday mornings are regularly scheduled small group studies for everyone. Click Here for more information on our current Bible studies offered. Come join Centering Prayer at 10 am on Sunday morning or join the group on Wednesday mornings when they pray for the church and community. We want your marriage to get off to a good start. Sign up for our pre-marriage sessions as soon as you become engaged. We have a dedicated team developing policies to keep everyone safe while at Church of the Servant. Come for dinner (5:30 pm) for a small fee. Stay for classes and activities for all ages (6:30-8pm). Playing at the Christian Reformed Recreation Center is great fun. COS fields multiple teams each summer. As a church, we strive to be an antiracist and multiethnic community of faith.